On Friday afternoon before the big kids and I got home, our next door neighbor returned from her trip to a conference in Texas. Because she is so sweet and always thinking of the kids, she brought each of the kids one of those inexpensive drawstring "backpacks" with a few random conference items inside: stress balls, rubber bracelets, frisbees, among other things. Because Piper was the only kid home with Big Dad, she took it upon herself to go through all three bags. Apparently, inside Caroline's bag was a handy dandy clip on black Sharpie. At this point I'm not quite sure where all this went down or how it ended up in the basement but Piper took it upon herself to tag the fridge on her little kitchen in the basement playroom while Big Dad sat up in the family room unaware. I guess upon realizing it wasn't coming off, she then hung a baby blanket over the fridge (the yellow gingham you see to the left in the photo). 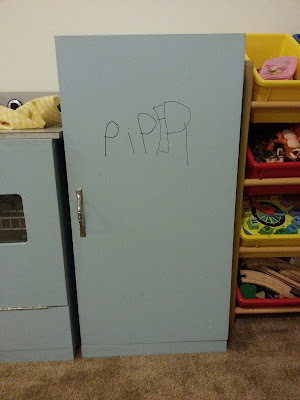 I noticed it on Friday evening and again on Saturday after she and Bryce cleaned up the playroom but didn't think much of it because Piper does quirky things when she arranges things. But later on Saturday when some neighbor kids were over to play, the blanket came off and guess what we all saw??? At first I wasn't concerned because I figured she did it with one of her markers, you know, the water soluble ones? She doesn't know where I keep the permanent markers. (When I got home from work on Friday and saw the Sharpie in Caroline's bag, I quickly banished it to my secret spot knowing something like this could happen.) I was angry at her for writing on something that wasn't paper, but I figured it would come off and we'd be done with it. However, sitting at dinner on Saturday evening, we talked about it some more and Caroline insisted that it was NOT water soluble marker so I started quizzing Piper. She immediately started hiding her face which is the first sign something is NOT what you expected and she's feeling ashamed. I asked her why she did it and she said (without missing a beat), "My inner voice told me to do it." She's not quite 5 years old, folks, and she has an inner voice that she acknowledges. C'mon!!! I have no idea where she even heard that term "inner voice." I'm telling you, this child thinks up things the other two never have. I kept up the interrogation until the story came out. I didn't try the Mr. Clean Magic Eraser yet (I know, am I crazy?) but given that the nail polish remover took off some paint and I know the Eraser will take off paint, I was a little hesitant. On Sunday morning, I took the kids over to my parents' to see my dad for Father's Day and I told them. Kind of funny since my dad just finally fixed the oven door on the little kitchen that he made in late 2005 because Piper broke that off when she was 2. And now she goes and vandalizes it. He had a giggle about it (much like he does about a lot of things Piper does) and then found a can of paint in the basement that he believes he used on it. Here's hoping. My neighbor wants me to try some kind of goop remover she has and I think I will try it and then paint it anyway. I'm telling you, you cannot leave this child alone. When the kids' two day a week, summer sitter, Moira was here this weekend for an orientation of sorts, that was something I said to her multiple times: Do not leave Piper alone. She thinks of things you wouldn't imagine.